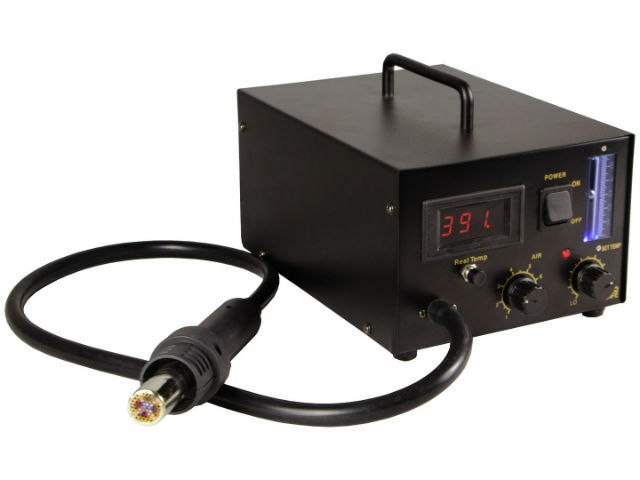 TME’s offer has been enriched by new hot air soldering stations from THERMALTRONICS, designed for repair works, creating prototypes, and production of electronics. High power and strong, regulated air flow make the THERMALTRONICS stations perfect for soldering components with high thermal capacity, including BGA packages. The stations are built with the use of ESD-safe technology, and allow working with both „leaded” and lead-free solder. Each station is equipped with four hot air nozzles with the diameters of 3, 5, 8, and 10 mm. Additionally, the TMT-HA200 station offers the stand-by functionality, and features a turbine placed in the handle. The TMT-HA300 model features a LED display, set/actual temperature switch, and an air flow indicator.